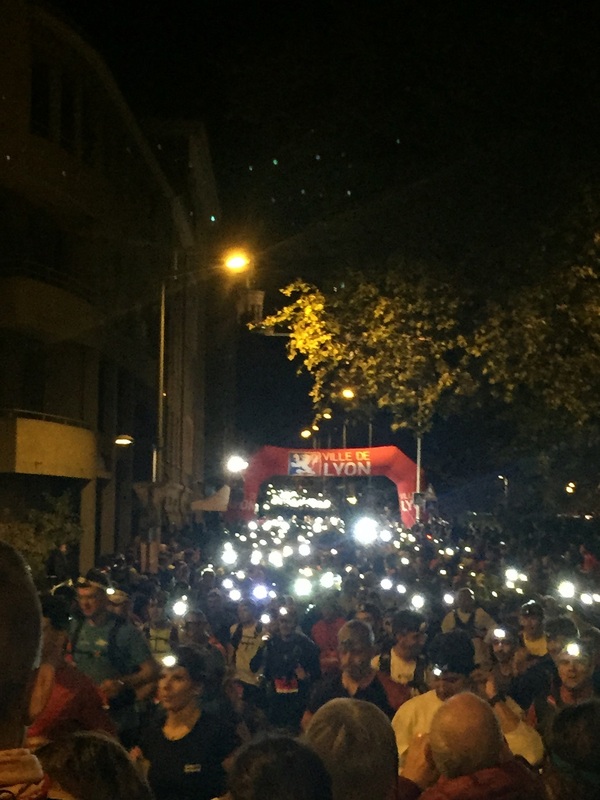 As I stood at the starting line of the night-time Lyon Urban Trail last week, a very rare thought crossed my mind: I looked smart (compared to everyone else around me). Actually, despite not having shaved for over a week or cut my hair for longer than I dare think, I really looked rather civilised. Who were these dishevelled, scruffy, people with long hair and thick ragged beards? And then it dawned on me: no one from mainstream civilisation would ever enter this type of race. Problem solved. 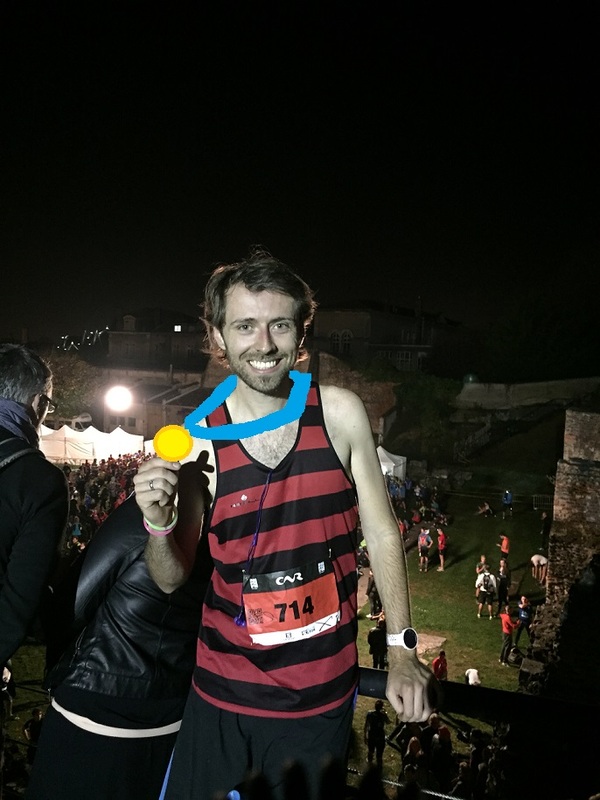 The race starts just next to the Roman Amphitheatre – a 2,000 year old arena which overlooks the city from the Fourvière hill. Unusually for any kind of race, the front runners wouldn’t be guided along by bikes or cars but by … motorcross bikes, which could manage to zoom up and down the steps and steep slopes. 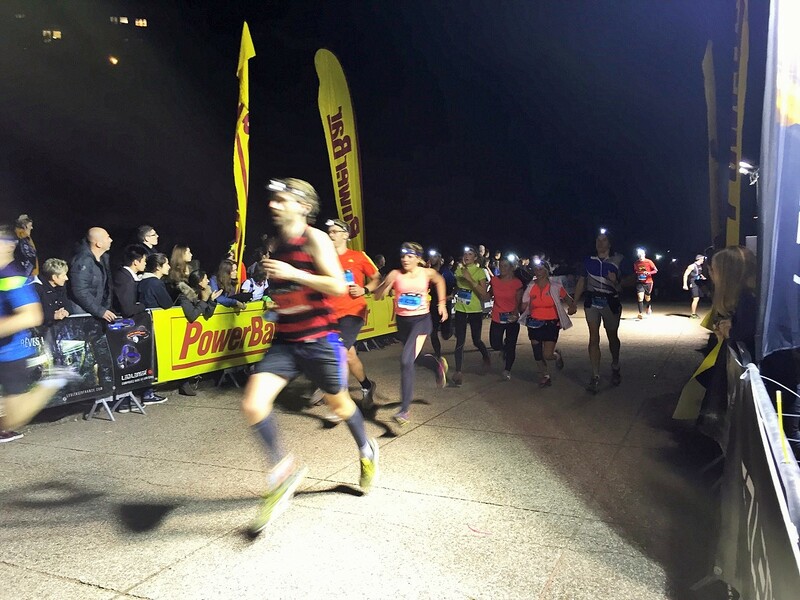 Although it was a night race, it was unseasonably mild and I gambled that my Herne Hill vest would be enough to keep me warm for the night – others seemed to have dressed for an Arctic ultra-marathon. The only piece of kit we all had was the mandatory head torch. 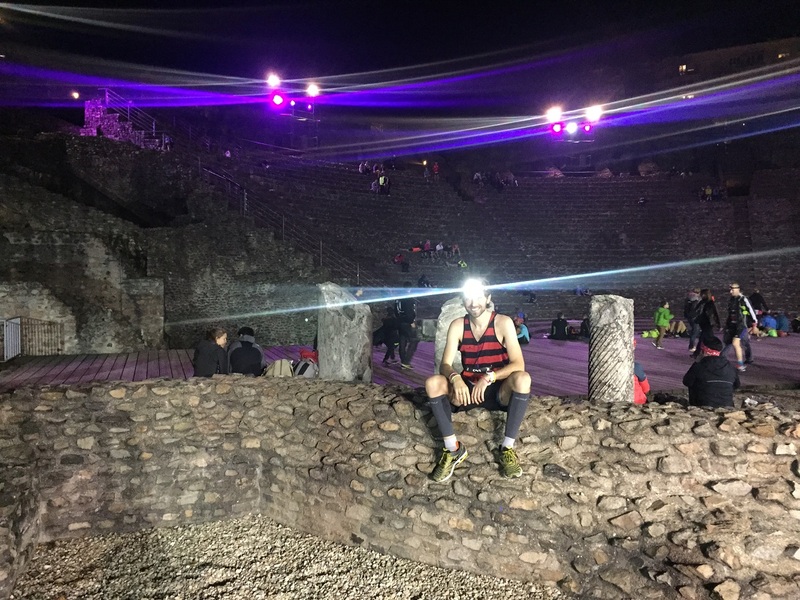 Some had clearly bought a £5 one – I’d bought the Petzl Nao, whose brightness is somewhere between a stadium’s floodlights and the Polaris Star. At 575 lumen, I looked a little like I’d escaped from an X-Men film shoot. Was I at a running event or a casting event for X-Men? After a slight delay, the speaker did the traditional countdown and, head torches beaming, 2,000 or so of us set off into the night. The first 50 metres were great: slight downhill, tarmac, nice breeze… We then took a right turn and it all went downhill. Well, uphill actually to be precise, up the first of many steep staircases towards the Fourvière basilica. This one was “only” 300m long at a 10 degree incline so nothing too bad. However, it set the tone for the next 5 kilometres, which were just absurdly hard. To summarise, they involved running up and down from the top of a hill to the river by any means possible: staircases, cross-country like muddy terrain (I never knew there was so much greenery in that part of town! ), cobbled paths, tarmacked roads etc. From kilometre 4 to kilometre 6.6, you went down 50m, up 100m, down 70m, up 50m and down 100m. The second 100m climb was over just 400m of the Montée de la Sarra – that might not sound that impressive but a 25 degree staircase for half a kilometre is bloody hellish. At the start of the race, most people were running up the steps. Then, we started jogging. Then, we were walking up every second step. By now, everyone other than the bearded mountain goats up front were slowly grunting and painfully hobbling up each step. 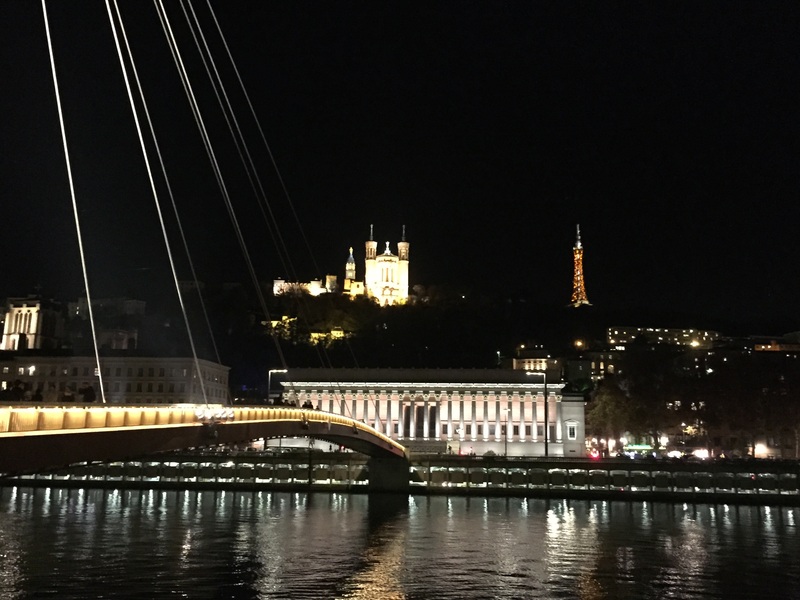 On the plus side, the views of Lyon were beautiful in this crystal clear night and, although I was running in my old backyard at times, I was also discovering parts of Lyon I’d never come across before. 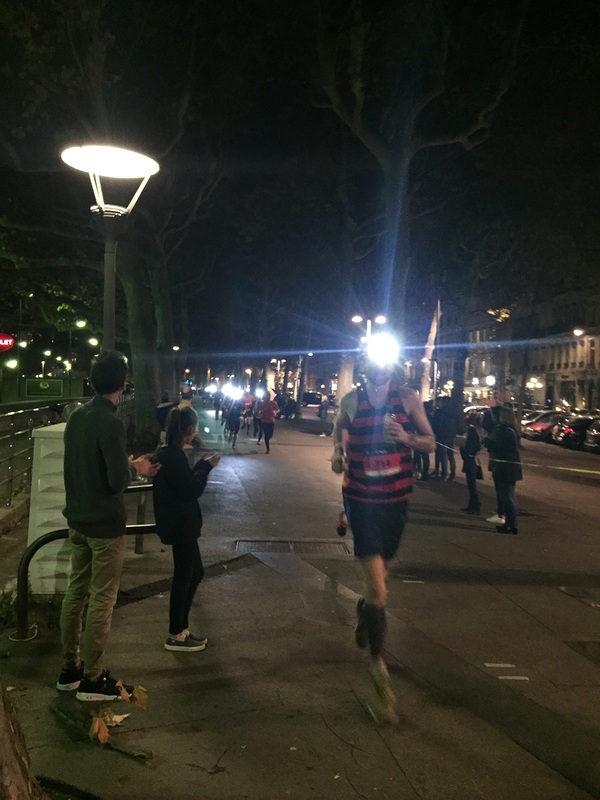 Eventually, after 8 kilometres or so, you reached the bottom of Fourvière after one last stint of suicidal tip-tapping down steps and flew past the St Jean Cathedral towards the Saone river, where Pippa was slowly blinding herself staring at all the runners while trying to spot me. As I went past her, I guesstimated it’d take me 2h30 to finish – in the end, it’d only take me an extra 49 seconds which either says something about my newfound awareness of my pace and skills or something about my rainman-esque brain. The latter, definitely. The course levelled out a little at this point which was a blessing – nonetheless, it wouldn’t have caused any harm if someone had come around with a leaf-blower to clear some of the descents. It was dry, thankfully, but it’d have been lethal if it’d been raining. We ran along the quayside for a few flat kilometres (although they still made us run up/down access steps a few times – why make it easy when you can make it hard?) 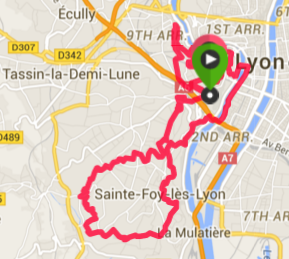 before we climbed one of the final steep hills towards St Foy les Lyon. After 13km (halfway), I was utterly drained of energy and, let’s be honest, really not enjoying it much. The Saone, Fourviere and…the Eiffel Tower? Then, something weird happened: it started to be fun. Just as the course started easing up a little and included fewer cliffs, my endurance became an advantage. Other runners were tiring and I wasn’t: I began overtaking some of the monsters who shot past me at the start. After a few more urban kilometres, we spent 5 or 6 kilometres in the woods running along rabbit trails with only our own beam to see amongst the pitch black darkness. All we could see was what was immediately in front of us and a few other headtorch specks in the distance. At this point, I was genuinely having fun, especially as I was still barging past a few people: at the last checkpoint after 18k, I was 182nd – in the end, I finished 134th. No medals – cheap bastards! As Julius Ceasar (apparently) said, “experience is the teacher of all things”. In this case, I’m not quite sure what I learned. I guess I already more or less knew that running up and down steps isn’t fun or easy. Actually, let’s end with a better quote of his instead: “Veni, Vidi, Vici”. There.